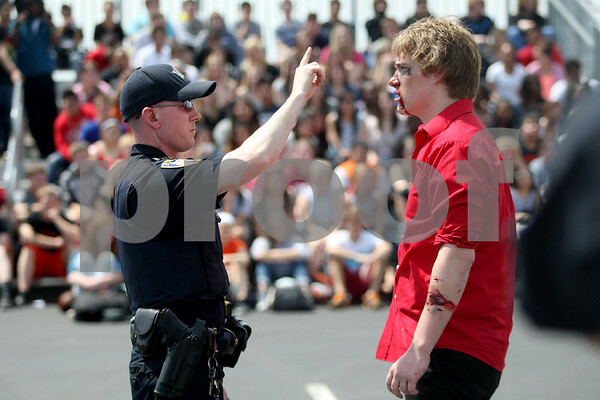 Officer Brian Bollow gives DeKalb junior Matt Peterson, who is pretending to be drunk, a sobriety test during a mock driving-under-the-influence car crash at DeKalb High School on Thursday, May 8, 2014. DeKalb police, firefighters and other officials volunteered their time to demonstrate real life-saving procedures during the staged crash. The purpose of the event is to deter students from drinking and driving and also from getting into a car with a driver who is under the influence of alcohol or drugs.